Precision Cross Cone Winder - Economic Type(TN-01) - Taining Machine Industries Co., Ltd. Simply frame, easy operation & maintenance. 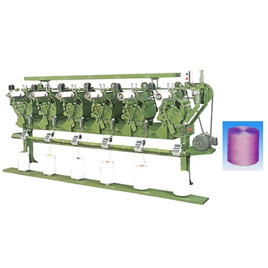 Suitable used for cotton, nylon, polyester PP/PE fiber and rope. With yarn breakage stop motion & Auto stop adjustment. With stepless adjuster is easily to adjust the layer for different yarn count to meet nice looking appearance of shapes. No yarn breakage at start by means of slow starter.